Editor’s Note – It’s hard for people in food deserts to get access to fresh healthy produce. Farmers markets at bus stops are a great way to provide access to these areas. For some people, getting fresh produce is as easy as walking to the nearby corner market. For those who live in food deserts, however, getting fresh food may mean multiple bus rides, long walks, and dragging heavy grocery bags across town. It’s no wonder that people in food deserts—defined by the Healthy Food Financing Initiative as a “low-income census tract where a substantial number or share of residents has low access to a supermarket or large grocery store”— are more likely to grab a hot dog or chips from the corner convenience store than trek to a supermarket across town. The Market at Wright Stop Plaza in Dayton, Ohio – The Market is a farm stand at Dayton’s main transit center that employs local homeless and serves transit riders. It’s a partnership between the county government and Homefull, a local homeless services organization. Netpark Transfer Center Farmer’s Market in Tampa, Florida – This market is a one day per month pilot program that provides fresh fruits and vegetables at the transit transfer center, as well as information on how to prepare the produce and tips for growing food at home. Fresh MARTA Market in Atlanta, Georgia – Fresh MARTA is located at a subway stop in Atlanta’s West End neighborhood where almost 50 percent of residents live below the poverty line. 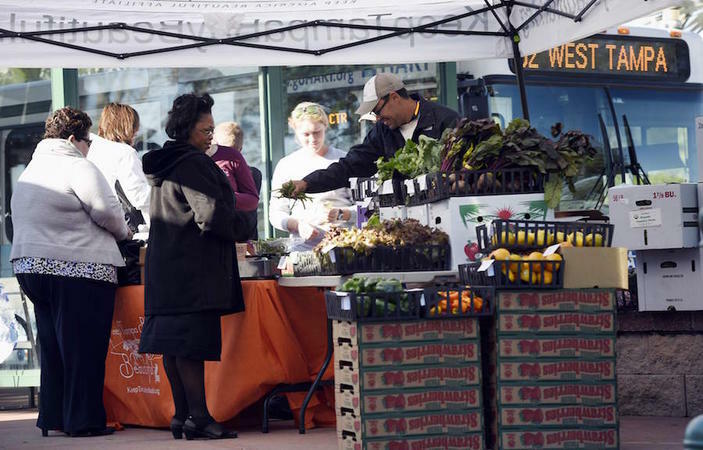 The one day per week market offers fresh produce, two-for-one SNAP purchases, cooking demos, a weekly bike tour of nearby urban farms, and free consultation about food assistance programs. If this pilot goes well, the plan is to open a farmers market at each of MARTA’s 37 stations.